Interstate 781 is the designation for the Fort Drum Connector freeway from I-81 east to U.S. 11.1 The freeway connects Exit 48A of I-81 with Iraqi Freedom Drive in Fort Drum, to the north of Watertown. Opened to traffic on December 5, 2012, I-781 includes a single point urban interchange (SPUI) with U.S. 11. The Record of Decision, which was issued on March 6, 2009 by the Federal Highway Administration, identified the Northern Alternative as the preferred alignment for Interstate 781. 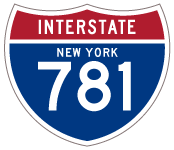 The report identified the highway as Route 781, without indicating the intended final designation of Interstate 781. With the Record of Decision complete, construction was scheduled to begin in early 2010. Once on Interstate 781, drivers have two choices, the single point urban interchange (SPUI) with U.S. 11 or the gate to Fort Drum. Photo taken by Valerie Deane (12/16/12). Interstate 781 end signage posted 1.5 miles west of the U.S. 11 off-ramp. Photo taken by Valerie Deane (12/16/12). Goulds Corners Road passes over Interstate 781 east, one mile out from the U.S. 11 SPUI. U.S. 11 travels eastward from I-781 to Gouverneur, Canton, Potsdam, Malone and ultimately Rouses Point. Photo taken by Valerie Deane (12/16/12). Delivery trucks and convoy traffic bound for Fort Drum should use U.S. 11 north to New York 26 (Fort Drum Road) to access the Army base in lieu of the gate east from I-781. Photo taken by Valerie Deane (12/16/12). A second end sign for Interstate 781 precedes the exit to U.S. 11. Speed limits reduce to 45 miles per hour ahead of the interchange. Photo taken by Valerie Deane (12/16/12). Eastbound Interstate 781 reaches the Exit 4 off-ramp to U.S. 11. Two lanes continue over the US highway and parallel West Creek to the Main Gate into Fort Drum. Those not heading to the base must depart here. Photo taken by Valerie Deane (12/16/12). A set of shields directs motorists along Exit 4 onto U.S. 11 south to Watertown and north to Evans Mills. Photo taken by Valerie Deane (12/16/12). U.S. 11 travels 1,645 miles overall between New Orleans, LA and Upstate, NY. Within the Empire State, the US highway tallies nearly 319 miles. Photo taken by Valerie Deane (12/16/12). An end shield for Interstate 781 appears on the hill above U.S. 11 by the eastbound on-ramp to the Main Gate of Fort Drum. Photo taken by Valerie Deane (12/16/12). U.S. 11 expands to four lanes ahead of the single point urban interchange with Interstate 781 (Fort Drum Connector). I-781 west leads drivers directly to Interstate 81 near Pamelia Center. Photo taken by Valerie Deane (12/16/12). Two lanes are allocated for the Main Gate to Fort Drum from the left-hand side of U.S. 11 south. Interstate 781 west begins to the right, with the control cities of Watertown and Canada for I-81. Arsenal Street (NY-3) is also featured for drivers wanting to bypass downtown Watertown. Photo taken by Valerie Deane (12/16/12). Interstate 781 travels uninterrupted between U.S. 11 and Interstate 81. An end sign resides midway along the rural freeway. Photo taken by Valerie Deane (12/16/12). One mile out from the Exits 1N/S trumpet interchange with Interstate 81 on I-781 west. Photo taken by Valerie Deane (12/16/12). Interstate 781 passes over New York 37 on the half mile approach to I-81. Interstate 81 north leads 25 miles to the Canadian Border via the Thousand Islands Bridge. Photo taken by Valerie Deane (12/16/12). A loop ramp carries drivers onto Interstate 81 south from Exit 1S. Downtown Watertown is a five-mile drive via I-81 to NY-12. Photo taken by Valerie Deane (12/16/12). Drivers taking Exit 1S merge onto a short auxiliary lane of I-81 south ahead of Exit 48 with New York 342. NY-342 represents the original route between the freeway and Fort Drum. The 8.37-mile route provides connections to adjacent New York 37 and NY-3 at Black River. Photo taken by Valerie Deane (12/16/12). Interstate 781 first appears on this mileage sign posted two miles south of Exit 48. The freeway provides a direct route to U.S. 11 for travelers bound for Canton. Photo taken by Valerie Deane (12/16/12). A parclo interchange (Exit 48) joins Interstate 81 with New York 342 just south of Interstate 781. The east-west route forms an 8.37-mile arc between NY-12 to the west and NY-3 at Black River. Photo taken by Valerie Deane (12/16/12). U.S. 11, the companion of Interstate 81 for the bulk of its 854-mile journey, turns eastward away from the freeway corridor at Watertown. I-781 sees one interchange along its nearly five-mile course, that of the SPUI with U.S. 11. Photo taken by Valerie Deane (12/16/12). 0.75 miles south of Interstate 781, Exit 48 departs I-81 north for New York 342. NY-342 provides a bypass route of Watertown for NY-3 from Black River to Carthage. Before I-781 opened, NY-342 was also the main route to Fort Drum from Interstate 81. Photo taken by Valerie Deane (12/16/12). The on-ramp from New York 342 forms a third northbound lane of Interstate 81 to Interstate 781 east (Exit 48A). Photo taken by Valerie Deane (12/16/12). Exit 48A leaves Interstate 81 north for Interstate 781 east. The freeway concludes at the gate to Fort Drum, providing a seamless link between I-81 and Iraqi Freedom Drive on base. Photo taken by Valerie Deane (12/16/12). Next step taken in building new road.” Watertown Daily Times (NY) July 1, 2008. Fort Drum Connector Project (I-81 to US 11) – Project I.D. No. 7804.26. https://www.nysdot.gov/regional-offices/region7/projects/fort-drum-connector NYSDOT web site. Final Environmental Impact Statement (EIS) for the Fort Drum Connector Project. https://www.nysdot.gov/portal/page/portal/regional-offices/region7/projects/fort-drum-connector/impact-nov08 (November 2008). Page updated December 18, 2012.